Nharangga people have lived and travelled throughout the Point Pearce area long before the arrival of Europeans. To them it was known as Bookooyanna. Their campsites can be found everywhere, especially along the coast, where stone tools, food remains and old fire places occur in abundance. Indeed throughout the entire Yorke Peninsula, the Point Pearce and Chinaman’s Well area contains perhaps the richest record of their presence. The area has many attractions, reefs rich in shell fish, good fishing and hunting, a wealth of bush foods and perhaps, most importantly, reliable fresh water which could be obtained from a series of wells and springs along the coast. Located at the Willows, these soaks would later become the main water supply for the Point Pearce Mission. 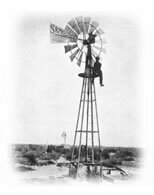 Adelaide was established in 1836 and it wasn’t long before European settlers were moving onto Yorke Peninsula in search of good farming land. The early settlers needed fresh water for their sheep and cattle and began fencing off the waterholes. Native bush foods were slowly replaced with pasture grasses, mallee forests were cleared and the land was fenced to keep in the stock. 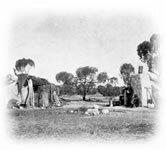 When copper was found at Moonta in 1859, many more settlers arrived on the peninsula and within ten years all but the most unsuitable farming land had been taken from the Nharangga people. Without access to their land, food and water resources, the Nharangga found the old ways of living increasingly difficult to maintain. While some found work as lamb minders and timber cutters, or collected animal skins and other items for sale, their plight worsened. 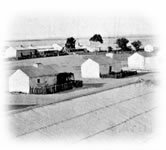 The mining settlements of Moonta, Wallaroo and Kadina became focal points for many people and fringe camps sprung up around these and other townships. The government established a series of ration depots from which people could get basic supplies of flour, tea and sugar and people moved between these depots and towns, continuing to hunt and collect bush foods where they could. 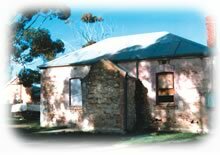 The Yorke Peninsula Aboriginal Mission committee was established in Moonta in the early 1860’s and Reverend W. Julius Kuhn, a Moravian missionary began teaching Nharangga children in a wool shed near town. 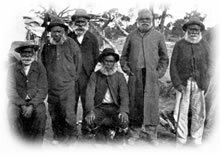 The committee began petitioning the government for a more permanent settlement and in 1868 the Point Pearce Aboriginal Mission was established. The settlement measured some 639 acres and was covered by thick scrub of tea tree, mallee and sheoak. Many of the Nharangga people were assembled at the mission and set about erecting the first buildings. A limestone quarry provided building material and a schoolroom and house for the Missionary were soon built. 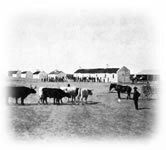 By 1878, ten years after the establishment of the Point Pearce Mission, it’s acreage had been increased, the population had grown considerably and crops were being harvested. The settlement was like a small township with cottages and houses, wool sheds, workshops, a church and large underground stone tanks. A stone-walled garden supplied the kitchens with vegetables while water was carted from the Willows, where a series of windmills pumped spring water to the surface. Later, piping was laid to large storage tanks within the settlement itself. 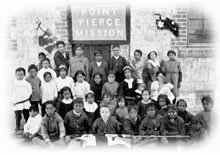 When Poonindie Mission, on Eyre Peninsula, closed in 1894, Point Pearce became home to many of its people and new cottages were erected. The mission continued to expand and in late 1935 the hall was built. Other buildings included a meat shop, blacksmith’s, wheat barn, piggery, shearing sheds and chaff house. The Point Pearce community was largely self-sufficient, and much of the building on the mission was done by the residents themselves. Only a few of these older buildings remain today and include the office, the former school, the hospital and several houses. Tanks and windmills also remain at the Willows and the limestone quarry can still be seen toward Moongherie. The hospital began its life as the storekeeper’s residence. In 1924, this building was set aside as a hospital and a full time nurse was appointed. The facilities were limited however, and more often than not, a dose of castor oil was the only medicine administered. The hospital closed in the mid 1930s and is again used as a private residence. During the early years children were taught in the church building. With an increasing number of children living at Point Pearce however, the need arose for a more suitable building. The first school was commissioned in 1906 and twenty seven children were placed on the roll. Most of the children were only taught to grade 4. As the population continued to grow, the small classroom soon became over-crowded and a new school was built in 1925. The old school was converted into a cottage. The soaks and wells at the Willows supplied freshwater to the mission throughout the early years. Water had to be carried until the early 1900’s when piping was laid from there to the Point Pearce settlement. Windmills pumped the water to large store tanks in the north eastern corner of the mission. Buck’s Tank was half way along the pipeline and a refreshing drink could be obtained from an old jam tin which hung in tank. The old cart track still remains in use and many old ruins can still be found at the Willow itself, including large tanks, windmills, piping and a pumping shed. Point Pearce Mission was founded in 1868. Generations of Nharangga people had lived and travelled throughout the area before the arrival of the Europeans. To them it was known as Bookooyanna. Some of these campsites contain many thousands of stone artefacts, shellfish and other food remains. Old fire places can still be found.